Test Data: BF- .78 LE- 7.00 WPDA 1.68 at 293 lbs. We found this boar at the 2017 World Pork Expo, he had not ate a bite of feed in 4-5 days. When they moved him to the show, all he wanted to do was breed. He placed 2nd in his class and stood out above the rest. We brought him home, collected him a couple of times and got him back on feed. He now looks like a million bucks. He was the tallest fronted, heaviest boned, and most athletic Duroc boar at the show. His feet and legs are impeccable. Study his rear picture, he is big legged and extremely true and square to the ground. He is opened up in his chest floor with a big rib cage and plenty of body. He has a high head carriage and is long necked and clean throated. Focus has a big back and full rump. His underline is excellent. 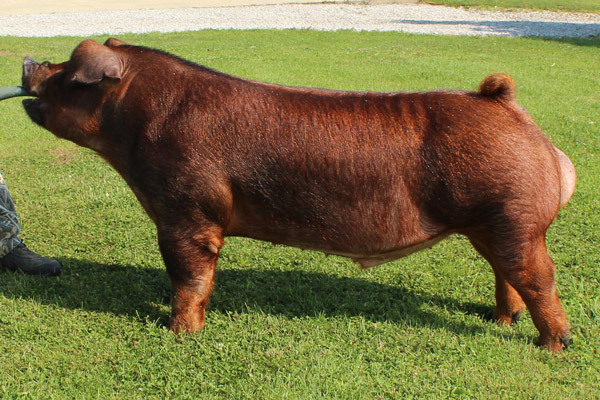 This is one good Duroc boar with an explosive pedigree. His littermate gilts placed 1 and 2 in a very deep class in the junior show. The littermate that was 1st went on to by the Champion Duroc Gilt in the Junior show at WPX and was selected to be Reserve Champion of the entire show over all breeds with over 6000 entries in the whole show. Better Focus in on one here guys!! !